Main-Events.com was launched on September 1, 2008 and has since transformed into a highly sophisticated and secure online entry application that embraces social media integration and is mobile friendly. In the first six months, 28 shows used the online entry. That’s 2,076 customers with 3,406 horses entering 13,635 classes. Shows as prestigious as the NZ Horse of the Year Show and the Australian Showjumping Championships are Main-Events.com converts. Home page as at September 2013 showing upcoming events. Your show should be here! Make it easy for your customers/riders to get all the information they need. List your event and all the important information (schedules, entry forms, waiver forms…) on the Main-Events.com calendar. The calendar contains ESNZ and EA shows, A&P Shows, Pony Club, and more all in the one place. Click here to see the current calendar. The Calendar is free to use. Simply create the event and upload the information. You can also go back at any time and update or add to the information. To add your own event, click here to go to the event listings, from there you can add your own event by clicking the green "Add a new Event!" button. Note: Before adding your event check that it doesn’t already exist. Main-Events.com might have started the process for you. If it does exist, simply click “Claim the Event” to take the reins. More and more, riders are expecting to enter their events online. The Main-Events.com online entry system is simple, reliable and cost effective. To date over 70% of users found online entry a positive to very positive experience! The online entry system is completely customizable and offers a rich set of tools to setup your event and classes with any and all information that you need. With online entry, you no longer have to read illegible horse names, and riders never miscalculate their entry fees. Think about the time you will save. 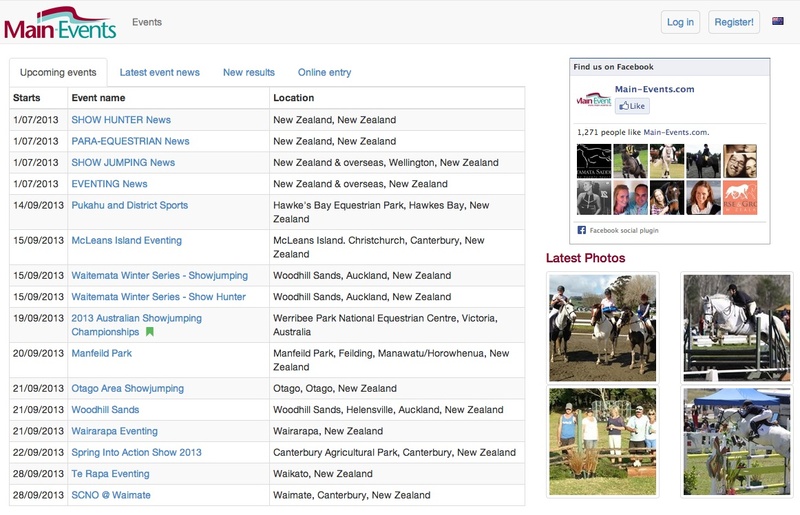 Main-events.com has been well received by the NZ and Australian equestrian communities and we’re excited to continue to grow and provide users with the highest quality online entry service. Online entry is currently priced at $1 per customer and 2.5% of total fees making it the best deal on the market. Do we have to use Main-Events Software? Main-Events online entry can be used by any show. If you have Main-Events software, you can easily export the event information (classes and fees) to the website. Once the entries close you can then download the online entries as an xlsx file that is merged back into the Main-Events data file. If you don’t have Main-Events desktop software, then you simply type in your list of classes and fees online. Once entries have closed you then download the xlsx file of online entries and copy & paste into your show system of choice. How do the riders pay? When you set up your show online, you can choose from the payment options listed below. Credit Card payment has recently been implemented through PayPal. Note that there is a small surcharge to pay by credit card. Main-Events.com has a demo version available so you can try it for yourself. Main-Events.com is available to talk you step by step through the online entry process. To learn more about Main-Events.com, email anne@main-events.co.nz or call 06 378 2310 (NZ).